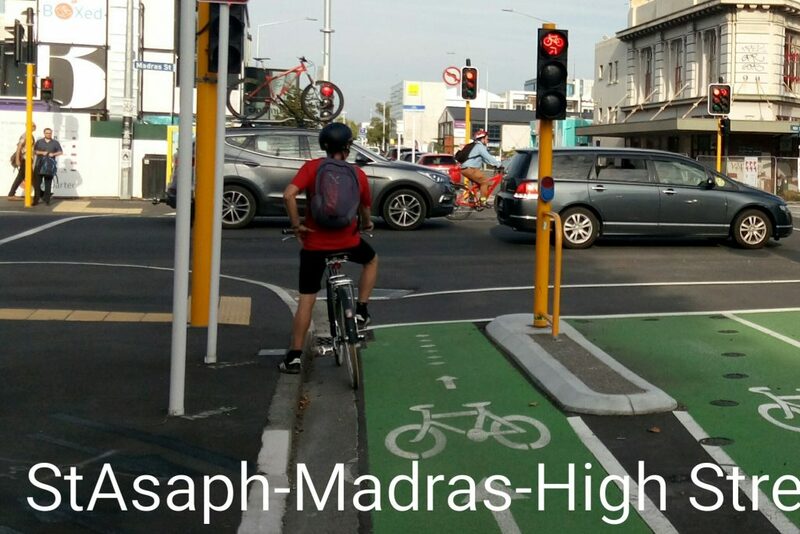 The controversy of St Asaph Street cycleway. A little bit of anger perhaps that so many ‘experts’ in the comments section of The Press or on Facebook would, with each inhaled breath, deride those who rode a bike for every sin under the sun, then go on to exhale with bluster that cycleways were a complete waste of ratepayers money because nobody used them. An idea. Inspired by a Facebook post from the one and only Catarina Maria showing wet day numbers of those biking along St Asaph Street from her dry and snugly cafe location, followed by an invitation to join the Action Bicycle Club/Generation Zero ‘Go By Bike’ Breakfast on June 7th 2017. 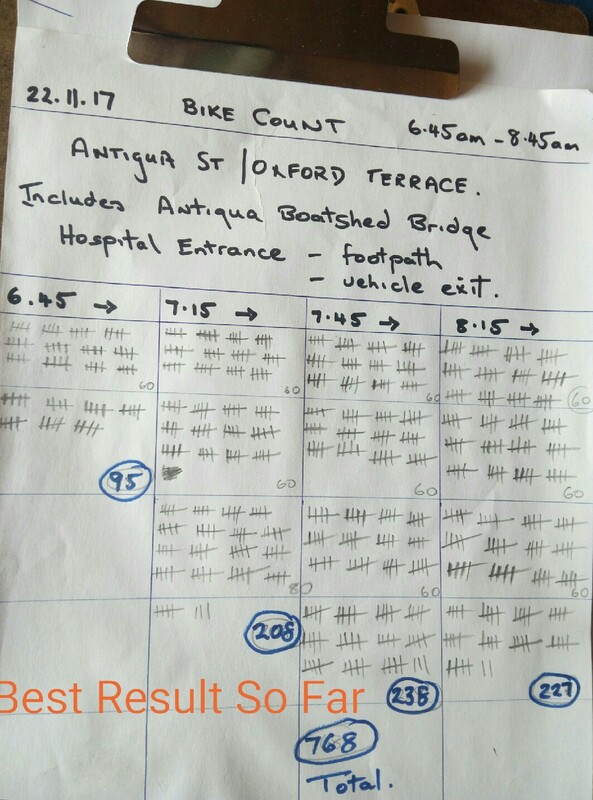 I turned up duly at 7.00am (5 degree temp) with clipboard in hand and counted those riding to work along St Asaph Street and through the Madras Street / St Asaph intersection for an hour and a half. Next morning from 7.10am until 9.10am I was sitting on a cold stone seat just south of the Antigua Boatshed Bridge counting anyone who rode a bike over the bridge in either direction, and anyone crossing through the Antigua Street/Oxford Terrace intersection (now partly blocked off). This time 635. For that surprising result, the price was a sore neck from continual moving of the head through an arc of 180 degrees, tired eyes from the peering and an ice-cold bum. But hey, how impressive was this. The seed was sown. Given that this method of counting is unofficial, and runs the risk of inaccuracy and bias, of how much use can it really be though? Well, it is useful to me. Regardless of the accuracy, when someone says to me that people do not ride bikes in Christchurch I can honestly tell them that they do, show some figures and tell the story. There are those who will remain permanently unconvinced (that is OK) but some genuinely want to know more. I see this as progress. Show people the evidence in an amicable manner and let them make their own judgements. 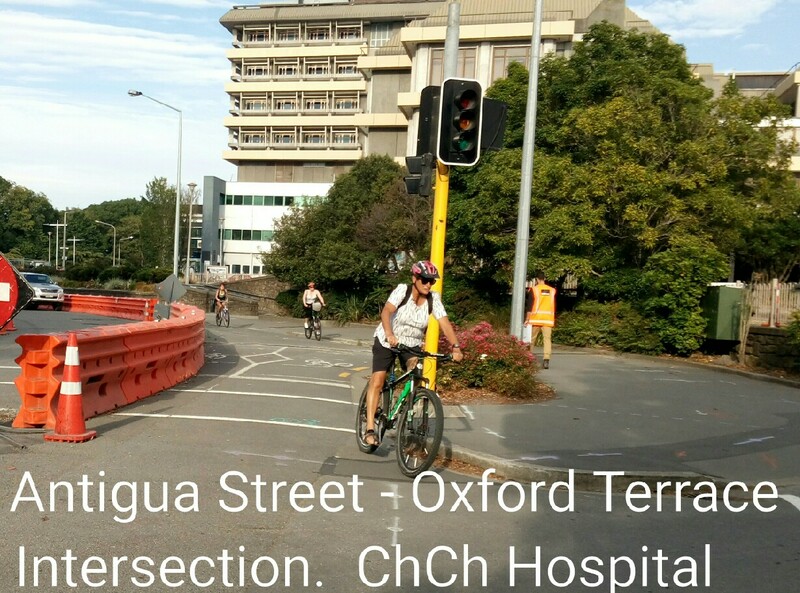 Even the unconvinced have to bend just a little when I tell them Christchurch Hospital has 1200 bike parks and suggest they go try and find an empty one on a fine week day. Being a bit of a statistic-phobe I find raw crude data quite powerful, despite the obvious limitations. The other reason I do this (when time permits) is because I find it enjoyable. Most counts are done during early morning commuter time (from 6.30am or 7.00am for 2 hours). Knowing how many people ride bikes into the city is important information for traffic planning, car and bike parking requirements and just how effective bikes can be at reducing peak time congestion. I enjoy experiencing the dawn of another day in Christchurch. I am interested in watching all forms of transportation modes and always wonder who is going where and for what purpose. As expected, as the weather has improved, all counts have shown increases over time. Lincoln Road is my favourite spot despite the uncomfortable fence to sit on. The flow is manageable and consistent and visibility good. There is such a variety of people. There are the Little River Link ‘newbies’, heading NW to the employment areas of Middleton and Wigram from the southern suburbs, to get to work at 7.30am.Then there are the fast and furious along Lincoln Road heading to the CBD for a later start. These guys have been cycle commuting for years, as evidenced in the quality gear and faster bikes. I have undertaken one afternoon commute count. This was at Edgeware Village in December 2017. Morning commutes are easy counting, everyone is going somewhere with a mission. At the end of the day, there’s errands to do and shopping stops to make. Bikes would appear from all directions and park-up somewhere unusual. It was harder to keep track of what was counted and what wasn’t. And yes, people came out of the supermarket with bags full of groceries, jumped on a bike and went home for dinner. 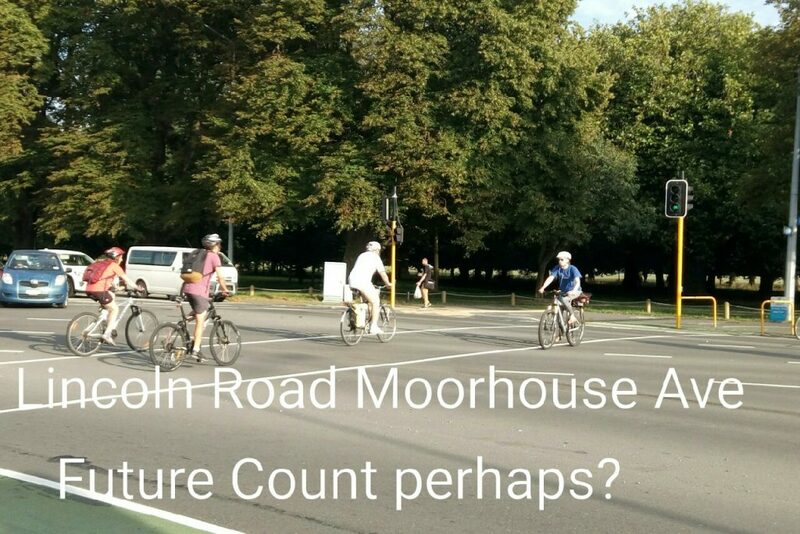 Does it matter that I count bikes not using the Major Cycleways ? Not to me. I make it very clear exactly what route/intersection/direction is being counted and will indicate the numbers using the cycleway at any point. Riders not using the cycleway concerned (e.g. Lincoln Road) are itemised separately. Times are strictly kept. It is tempting to add that big group that rolled through after cut-off, but this serves no purpose. In places (such as Edgeware Village) where someone rode up, parked and went to the supermarket (for instance) and returned the same way 50% were counted as two journeys, 50% as one. If it were a vehicle, two separate journeys would be recorded. I am just being conservative. Included are Mobility Scooters, E-Bikes, Bikes being wheeled on the pavement, Adult Tricycles. Cold weather counts are just as useful as fine weather ones; however, I do not purposely go out in the rain. The detractors can have their time in the sun on this, I don’t care. Some more counts will be done in February. Where else could Robert do a count? Great stuff Robert! I was just wondering if there is somewhere to view your full set of data? I’m particularly interested in Lincoln Rd as it seems to have heaps of people ride bikes down it (I’m one those fast and furious ones you observed). 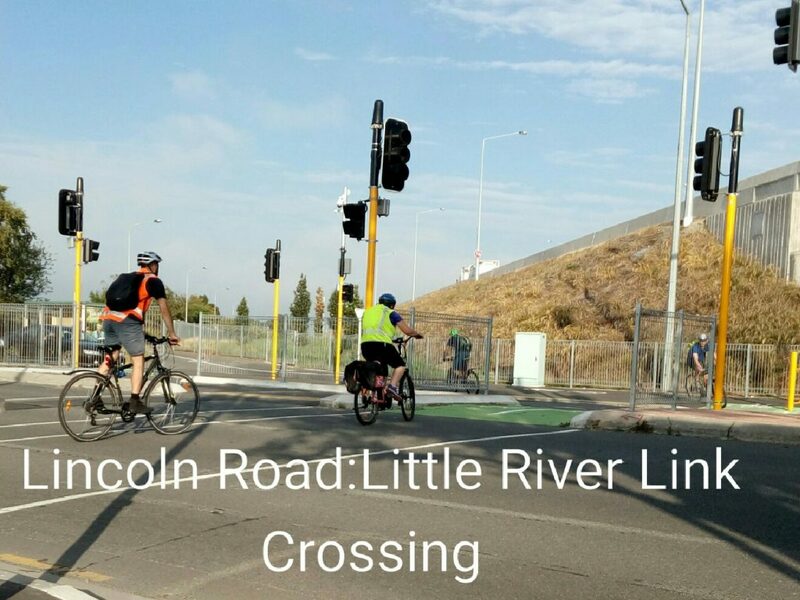 Chris, I have done 3 counts on the Lincoln Road LRL Crossing. All were for 2 hours 7.00am to 9.00am . First on June 10th a total tally of 231. There was no break down of directions for this. Count on August 2nd , a total of 260. Of this 131 (50 % ) were city bound along Lincoln Road direct . 61 (23 % ) were exclusively on the LRL cycleway heading from the SE toward Middleton. 47 (18 % ) switched from one route to the other. Equal numbers of these moved from LRL onto Lincoln Road to continue to the city or changed to the LRL from Lincoln Road to continue towards Middleton. Only 8% were heading to Halswell on Lincoln Road direct or toward Barrington Street on the cycleway direct. Third count on Jan 15th totalled 370. Whilst mostly the directional breakdowns were proportionally similar to previously , the most significant % increase by comparison was traffic on the LRL directly heading SE to NW to Middleton ( 61 to 95 ) . If this trend continues it does bode well for the LRL to become a worthy link for cycle commuting between southern residential areas and the western employment areas. Well done Robert. As long as you abide by your set parameters at each location, you’ll be getting meaningful data. I have pondered the difficuilty of quantifying cycle use, because although I commute thousands of km per year, I never get near a cycle track between home and work. I do uses Strava though, and always tag commutes for what they are. All the data Strava collects is available to purchas by organisations like the CCC. I wonder if the answer to discovering where cyclists ride, how far they ride, and for what purpose, could be as simple as encouraging riders of all types to use Strava or a similar app, perhaps even a CCC developed one, and tag their rides according to use? You’ll be pleased to know that CCC is already using Strava data for some analysis. Notwithstanding its inherent user biases, focusing on the commuting trip times is revealing some useful patterns for where the main cycling routes are. In the picture of St Asaph / Madras Corner notice the white diamonds and arrow, the cyclist is not on them but is to the side with foot on the kerb. I don’t know about that particular intersection, but I recently discovered that if you ride over those white diamonds it triggers the lights to automatically change. The Lincoln road crossing is great for that as the diamonds are quite away back and often I am able to time it so I don’t even need to stop. Correct, the diamonds indicate the best placed to be detected, either by an underground detector loop or one of the newer overhead detectors. In many cases though on dedicated cycleways you have a fair bit of a margin for error, as the sensitivity is quite high; for cycle detectors on the road you may need to be a bit more precise to trigger them.